It can be disorienting when the past, present and future collide, particularly in a sacred, public, historically communal space. It requires a special kind of courage, because it’s not just memories that cloud: it’s sights and sounds of people that remind one of sights and sounds of other people—folks long gone but always present, just under the surface of what can be seen—until you become lost in all of the realities you have known. Authors like Babara J. Kukla, a former Star-Ledger colleague from this writer’s half-a-lifetime ago, can have that effect without perhaps even knowing it. Her Wednesday book launch, at the Newark Public Library, brought together Newarkers of all races (although not exactly all ages) to celebrate themselves and their good works. Like any good Newark public event, Black and Brown Power met grassroots community service, and merged with Black Christianity and performance art. Praise dancing and poetry and a quick bar from 16-year-old future jazz great Alexis Morrast blended in with public congratulations from the new New Jersey Lt. Gov. Shelia Oliver and Newark City Council President Mildred Crump, Newarkers all in root, style, grace and thanksgiving. 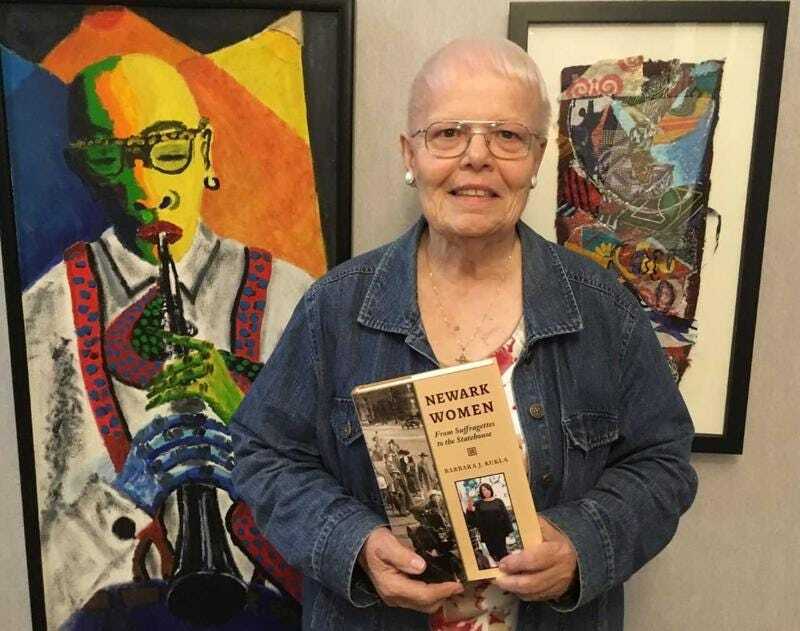 The book: Newark Women: From Suffragettes to the Statehouse. Eight hundred women—including Trump and Oliver, the latter part of the book’s cover—are briefly profiled throughout Newark’s 352-year history. The author and publisher: has covered Newark and fought for its people’s humanity since this writer was in pre-school. The goal: To document the city and the people she has loved for most of her life, to keep the Newark she knows alive. Look around and see everybody: business leaders, school leaders, community leaders. Citizens who consistently believe in their own power to create something positive. Those who believed in people no one else believed in, whom no one else saw. In the last quarter of the last century, Newark once had three well-known griots/djali/djelis: Clement Alexander Price of Rutgers-Newark; Charles F. Cummings of the Library, and newspaperwoman Kukla, who’s “Newark This Week” zoned Monday section of The Ledger was, for the city’s self-esteem, required reading—a spiritual and cultural nourishing, really—for more than two decades. (Sadly, Newark has waaayyyy more orators than authors.) The only Black member of that trio was Price. Both he and Cummings have joined their Ancestors. For the role they played, in fighting against constant worldwide ridicule, the symbolism could be extended from griots to “griottes,” a special type of marble or limestone. They planted themselves in the scattered Newark dirt, and saw the beauty in the concrete. Kukla is shown here with this writer’s friend, the Rev. Maria Westbrook. (Thanks for these pictures, Maria!) The feature lead entry in the book’s Religion section, she is one of those Newarkers whose commitment to the city’s youth goes back decades. Westbrook, like many of the African-Americans in the audience, knows that acknowledgement, from the most private to the most public, destroys cynicism. So Westbrook worked the room, nudging the other honorees in the room to sign the pages of their entries. A significant act of cross-acknowledgment of individual labor in the service of collective victory. The author’s individual labor contains multitudes—literally, in this case. At times, it seems that she has kept not only the names of those laborers like Westbrook in her encyclopedic mind, but their family trees as well. Newarkers well know that Kukla—who once told this reporter many teeth and hair strands ago that when she visits a new city, she drives down every street—can tell any aspect of late-20th Newark history at the drop of a formerly ad-rich Star-Ledger, but what was amazing Wednesday night was that when she mentioned various people in the room, some in the book and some not, she also mentioned the names of their children, of their spouses, without blinking or pausing. Detail is paramount in journalism, but Kukla goes well beyond that. She actually knows hundreds of these people, as people! She has been on the ground with them, witnessing their private, often painful lives. One of the many reasons Kukla is a very an interesting city fixture has to do with her being, well, Newark-white. She could never be confused with, say, Upper Montclair’s Dale Russakoff of The Washington Post and The New Yorker, who herself wrote a powerful book on the city. Russakoff is an elite insider, a nonfiction do-gooder, a kind (of) visitor to The Ark. Kukla’s world, one filled with the city’s jazz and history, is largely a Black, working-class one. (She did made sure that night to acknowledge some of the non-Black women in the audience who are in her book, and that was important. Newark’s working-class identity and commitment to autonomy—community kujichagulia—is the linkage across the city’s historic and continuing rainbow of people.) The West Orange resident manages the feat of understanding the African-American grassroots experience and participating in it as an earned insider without being an imitator. When she talked about how her Christian faith and her (Newark Black) church helped her become a breast cancer survivor, Westbrook and the predominately Black audience Amen-ing understood that the God she worshiped side-by-side with them—the one who delivers them from personal pain back into the struggle of daily survival—was their God, too. The griote who remains repped Brick City when it was considered the worst place in the Milky Way galaxy. She saw and wrote about the struggles of real people here—citizens of New Jersey’s largest city. Like the current, re-elected mayor, she openly respected its people, day to year to decade. They saw and recognized those who, if one is honest, would probably admit were not used to receiving such examples of humane-ness. She saw the dignity of their lives when that was not popular to do, and was determined to make sure they got the same public treatment in newsprint others got. She still has that determination. Newark Women is book number seven (about the city) from her, and there is no doubt that more will spring forth into the yet-to-be-revised city’s future. The author is just in time, and she knows it. Newark’s history has always evolved—Pilgrim to German to Irish/Jewish to Italian/Jewish/Italian to Italian/Black to Black/Latino. But the constant has been the home it has provided to the working-poor and the think-they-are-middle-class for more than a century. Gentrification’s steady trickle threatens the beginning of the end of the city’s half-century ethos of permanent-power-to-the-people. The fists are still raised in The Next Brooklyn, but there are fewer now. The small town of Black/Brown/Portuguese people who decided to change the world by controlling the space where they live, the residents of a patch of land where lobbying the right person at a single meeting could change a major decision’s outcome, is dying, obit by obit. Her book, which struggles to be a current praise song, not a funeral dirge, displays the power of the special kind of caring, consistent resistance women exemplify—the stubbornness to love and work stable communities into existence. Kukla’s life in Newark letters and literary mission show not just the power of the written (largely working-class) word, but how the word is related to the act of building, maintaining and remembering community. And how that courageous choice to create a collective destiny—forged by love of self, of people whose destiny you share, and of public space you are determined to control—can shape an entire world. It clearly shaped hers.